I wanted a radio for my kitchen to entertain me whilst cooking, and I’m pretty much sold on DAB. It may not sound perfect, but it’s better than a poor signal on FM or AM—and it’s not drowned out by the sidebands of South London’s numerous pirate stations. There’s also a much wider choice of stuff to listen to. DAB radios are still a new enough technology that it’s quite hard to find a good cheap one, so I was interested when I saw this one on the shelf at Tesco for £35, less a few pennies. However, I was wary, and I wouldn’t have bought it if they hadn’t had one plugged in for me to hear what it actually sounds like. (There’s a lesson for retailers there.) It sounded acceptable in the shop; having listened to it at home, I can confirm that it does, indeed, sound pretty good. The bass response is what you’d expect from a radio of that size: limited but respectable by virtue of the volume of air in the enclosure. It’s certainly not offensively squawky in the way that some portable radios can be. You do get what you pay for, to a certain extent—the fake wood of the case doesn’t benefit from detailed scrutiny, and the front panel is only silver plastic, for example—but it’s solidly constructed, simple and elegant, and doesn’t feel cheap or shoddy. The interface is easy to use, and the screen is clear. It also receives FM broadcasts, and seems to do so well enough. It will even run off batteries, although, given the elevated power draw of DAB sets, that’s probably not a great idea unless your surname is Duracell. 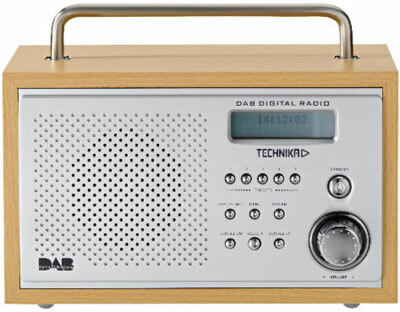 All in all, it’s a reasonably-priced, thoroughly competent DAB radio. I’m satisfied with it.